Petoo. 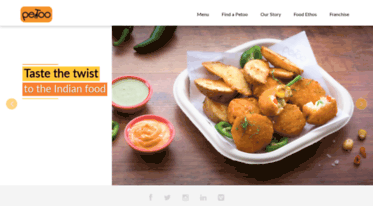 Order Food Online - Petoo prepares best of Indian food and delivers it super fast at doorstep..
Read Petoo.in news digest here: view the latest Petoo articles and content updates right away or get to their most visited pages. Petoo.in is currently listed among low-traffic websites, with around 22K visitors from all over the world monthly. It seems that Petoo content is notably popular in India, as 91.5% of all users (20K visits per month) come from this country. We haven’t detected security issues or inappropriate content on Petoo.in and thus you can safely use it. Petoo.in is hosted with Amazon Technologies Inc. (Singapore) and its basic language is English. Order Food Online - Petoo prepares best of Indian food and delivers it super fast at doorstep. Petoo - find who we are, why we started Petoo and who's the team behind.